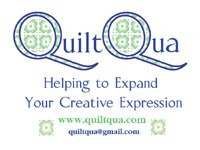 Sarcastic Quilter: Goodies in the mail! As I sent swap items, I'm so excited to say I received my items, too! From the Secret Santa Swap hosted by Kara, I received the best scarf. It's soft and comfy and pretty. My favorite colors. I also received this awesome mini from Rebecca at Rebecca's Rags as part of the Sewing Summit Swap. It's just so much fun and I'm in the midst of searching out a great location to hang this lovely. Lastly, I've been doing just a little bit of sewing. I've started blocks for a quilt for my niece. I'm going to work really hard to have this done in time to mail to FL for Christmas. This is the Hearts Abloom pattern from the March 2012 issue of QuickQuilts magazine. What are you making for Christmas gifts this year? Wow ...that’s a gorgeous scarf with a pretty amazing history. Glad Gina was OK ! Love the blocks you’re making. Great colours and layout. Im slacking this year - Im not making any Christmas gifts ! Ack, that is crazy! I love your scarf. And your teal/black quilt is so absolutely stunning! As is the quiltie from Rebecca.